I talked to Anora Mahmudova from MarketWatch earlier this week about everyone’s favorite topic in the institutional money management world lately — the Ivy League college endowment performance figures. Performance numbers for fiscal year-end 2016 were relatively underwhelming. These things happen when you invest in risk assets. You can’t expect consistent results if you wish to seek higher expected returns. This is a simple fact many are missing when they discuss these numbers. These numbers are a little stale, but you get the idea. The problem is that Yale is now consistently beating Harvard, who has fallen on relatively tough times. Those long-term numbers are a distant memory in the what-have-you-done-for-me-lately college endowment world. The question I was asked is this: Why is Yale doing so much better than Harvard? Things have been slowly going downhill ever since. The endowment has had 6 different people (if you include interim chiefs) heading up the fund since Meyer left the organization. 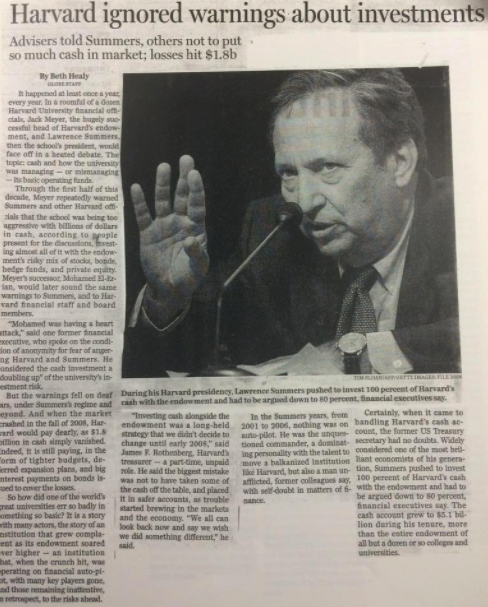 They were over-leveraged and illiquid, which exacerbated losses during the financial crisis and caused the university to borrow money at unfavorable terms during one of the worst credit crises in history. 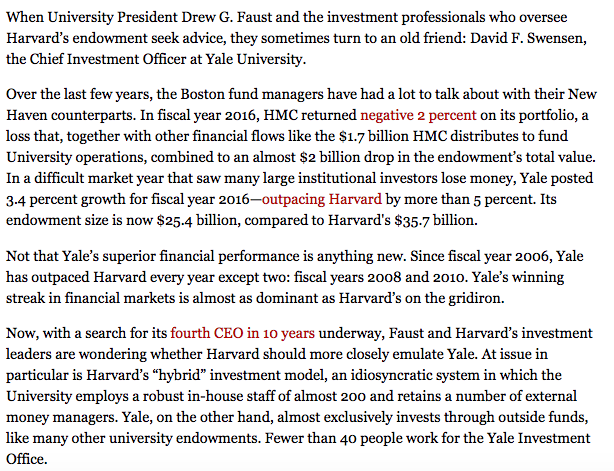 Let’s pretend that the endowment world worked like a professional sports league and Harvard was able to trade 6 future first round picks and Mark Zuckerberg’s old dorm room to Yale for the rights to David Swensen as their new CIO. Would this magically solve all of the problems with their investment performance? 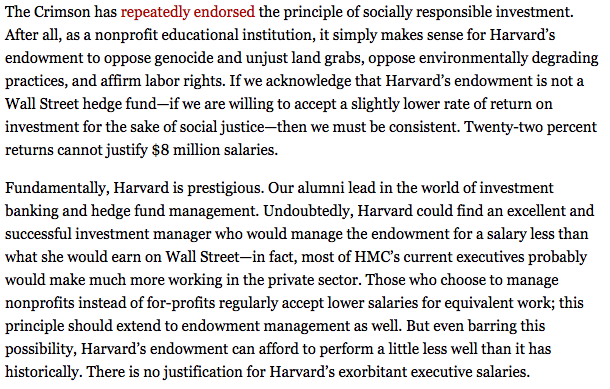 I’m not saying Harvard is a lost cause — they still have ~$37 billion after all — but they are focusing on the wrong problems here. It’s not the investment strategy that has led to their poor performance of late. That’s merely a symptom of much larger issues. It’s the organizational culture and a lack of leadership that has led them down this road. You’ll never be able to achieve investment-related alpha without first building up organizational alpha. This is something I’ve been thinking about a lot lately. I’m putting the finishing touches on a new book that should be ready in a couple of months (aptly titled Organizational Alpha). And I’m also gearing up for a panel by the same name at our EBI Investing Conference next month. The more I experience and learn about the money management world, the more convinced I become that investment strategy is secondary to people, organizational culture, leadership and philosophy. Not every individual or organization needs to manage their portfolio in the same exact way in order to succeed. There are many roads to Rome. But you actually have to have an overarching philosophy in the first place instead of jumping from leader to leader or crisis to crisis by making changes at every turn because you’re not happy with recent results. Swensen is able to succeed because he has a thoughtful investment committee and board in place who give him room to operate. They’re not breathing down his neck at every quarterly meeting. He’s created a winning culture, first and foremost. One of the largest sources of inefficiency that persists in the markets that very few people talk about is career risk. People who are worried about getting fired don’t always make the most rational long-term decisions. 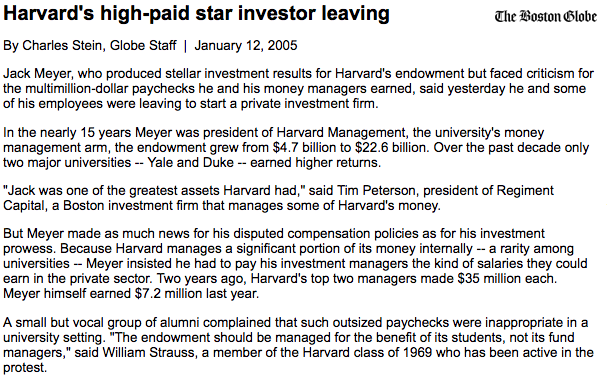 And there has obviously been a huge element of career risk for those leading the Harvard endowment. I would argue that it doesn’t matter who they bring in to run the investment program if they don’t instill a sense of continutity in how they run their investment program. This is not a problem that can be fixed by shifting investment strategies; this is an organizational and leadership problem. It will be difficult for anyone to produce great results with so much political and career pressure. This is the same reason so many pensions have run into trouble lately — the entire process is so political that it always turns into arguing and finger-pointing while none of the actual underlying problems ever get solved. Again, I’m not saying Harvard can’t turn things around. They obviously have the resources and the competitive drive to succeed. But my guess is they will continue to struggle as long as career risk is a huge threat, political in-fighting controls the narrative about how the money should be managed, and they lack the correct organizational culture to implement a successful long-term investment program.